Arrowroot can be found in the bulk section of health food stores, usually with the herbs and spices, or in the baking section on the shelf. Arrowroot is easily digested and is used as a glutenfree thickening agent in sauces, soups, and baked items. Preheat oven to 350º F and prepare a 5 x 9 bread-loaf pan by very lightly greasing it using a paper towel and small amount of melted coconut oil. Combine both wet and dry ingredients together and pour into loaf tin. Bake for 30 - 40 minutes or until golden brown on top and cooked through. To test, insert a toothpick into the center of the loaf. The bread is ready when the toothpick comes out clean. Remove from oven and let cool for 20 minutes. Carefully remove from loaf pan by flipping it upside down on a countertop. Lift up and allow your loaf to slide out. Flip loaf right side up and allow to cool completely on a wire rack. Slice your bread into 12 slices and store in a zip lock bag in the fridge. Fry eggs by heating a nonstick skillet over medium heat (grease lightly with ghee if not using a nonstick). Gently crack eggs into skillet, sprinkle lightly with sea salt and pepper, and cook until the whites are solid and the yolk is to your preference, 3-6 minutes. 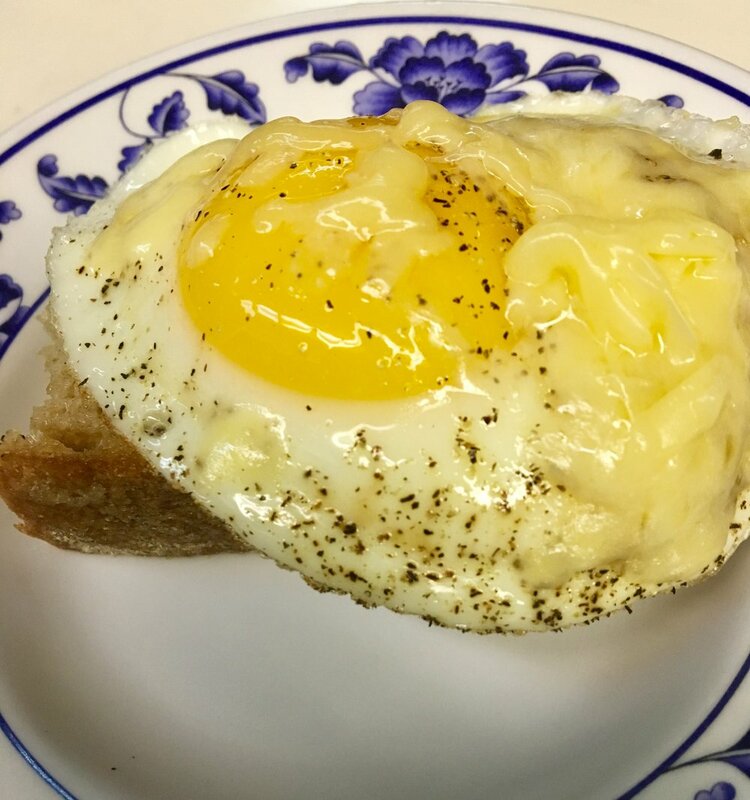 During the last 30 seconds of cooking, top eggs with cheddar cheese until melted. While eggs are frying, toast your bread in a toaster or on the stove top. If using the stove top, heat a skillet over medium heat. Add bread and cook until starting to brown on one side. Flip and lightly brown the other side. Plate 2 slices of bread side by side on each of two serving plates. Spoon on a thin layer of hummus to each slice of bread, about ½ tablespoon for each slice. Top each serving with 2 fried eggs and enjoy.